I started this process at 19 years old after dealing with all the signs and symptoms as a child. Doctors would tell my mother I was dealing with anxiety and that what I was feeling wasn’t really what I was feeling. So at age 22 I had a lupus flare and all my levels were out of whack. After my mother being diagnosed with “Discoid Lupus”, I was admitted at mercy hospital in Des Moines Iowa for two weeks going through testing and pain control. 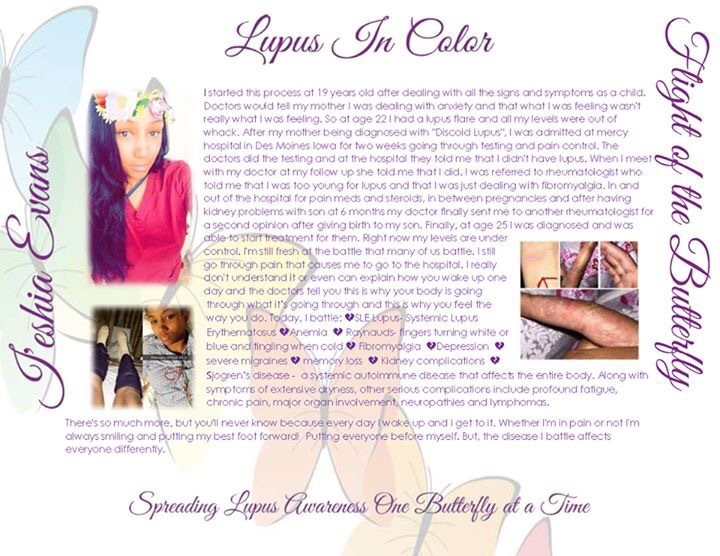 The doctors did the testing and at the hospital they told me that I didn’t have lupus. When I meet with my doctor at my follow up she told me that I did. I was referred to rheumatologist who told me that I was too young for lupus and that I was just dealing with fibromyalgia. In and out of the hospital for pain meds and steroids, in between pregnancies and after having kidney problems with son at 6 months my doctor finally sent me to another rheumatologist for a second opinion after giving birth to my son. Finally, at age 25 I was diagnosed and was able to start treatment for them. Right now my levels are under control. I’m still fresh at the battle that many of us battle. I still go through pain that causes me to go to the hospital. I really don’t understand it or even can explain how you wake up one day and the doctors tell you this is why your body is going through what it’s going through and this is why you feel the way you do. Today, I battle: 💔SLE Lupus- Systemic Lupus Erythematosus 💔Anemia 💔 Raynauds- fingers turning white or blue and tingling when cold 💔 Fibromyalgia 💔Depression 💔 severe migraines 💔 memory loss 💔 Kidney complications 💔 Sjogren’s disease – a systemic autoimmune disease that affects the entire body. Along with symptoms of extensive dryness, other serious complications include profound fatigue, chronic pain, major organ involvement, neuropathies and lymphomas. There’s so much more, but you’ll never know because every day I wake up and I get to it. Whether I’m in pain or not I’m always smiling and putting my best foot forward! Putting everyone before myself. But, the disease I battle affects everyone differently. They say living with lupus that you shouldn’t get pregnant but, I have 3 wonderful children. BryCeonna and Zariah Hawkins and Nasir Robinson. Although with my son I had Kidney problems, he still made it and I’m forever grateful for that. Sometimes I beat myself up for the sickness that my children battle because my immune system was weak but they’re here and I couldn’t ask God for perfect timing! It takes a strong person to stand by someone going through such situation/ life threatening like mines, never knowing if tomorrow I’ll be in a hospital bed, not being able to plan things out because we never know when my body decides to shut down. Watching me smiling having fun and then pain comes from nowhere 😢 As IF WATCHING HIS SISTER BATTLE CANCER isn’t enough💔😪. God really blessed me when he sent me Terrance Robinson and I promise that I’ll forever love Him because it takes a strong type of person to be a support. A person that can control their feelings in order to keep you strong you just don’t give that away. Many people have said to me that I don’t look like I have Lupus because I don’t have the butterfly effect or I don’t act like I have Lupus or I don’t show the signs! But, nobody wants to look like they carry an illness they never asked for. It does affect my lungs and chest and hands more than anything. People who say this, they have never felt the pain I feel. Until washing your hands is painful/burns and until preparing a meal is painful to the point that you spend a lot of money ordering food than cooking meals for your children. They will never understand. You never felt pain until taking a hot shower or bubble bath cause your skin to burn and for your body to go numb upon stepping out of the shower.. You never felt pain until your body aches from head to toe and no pain meds can help! You never felt the pain of your heart aching because you can’t take your kids outside for long in the summer because the sun burns through your skin. If I go outside to take snow off my car the cold burns my skin. I get shots in my stomach to prevent clots and when I’m in pain they literally almost have to put me under to take the pain away! I’m at the point I hate the hospital! 😩😏 Over the years I have lost jobs because of being sick and being in the hospital or calling out because I couldn’t get out of bed or because my children were sick. 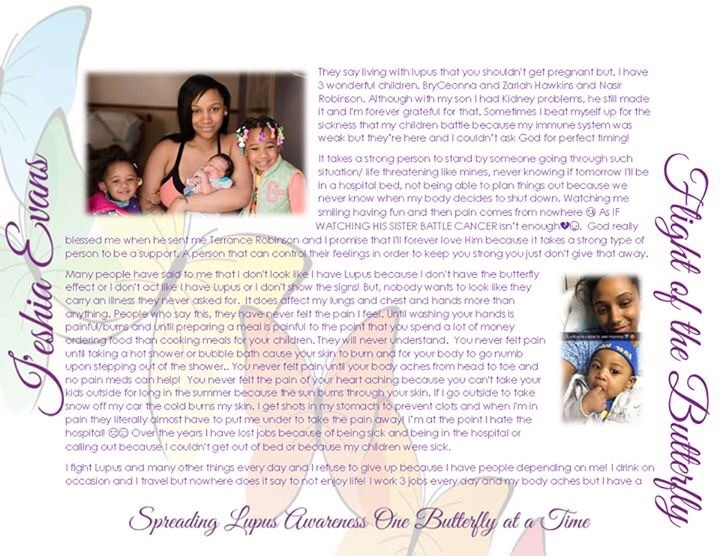 Lupus In Color is excited to present I’eshia’s story to the world. As a Lupus Warrior she is actively promoting lupus awareness and wearing the armor of strength in doing so. 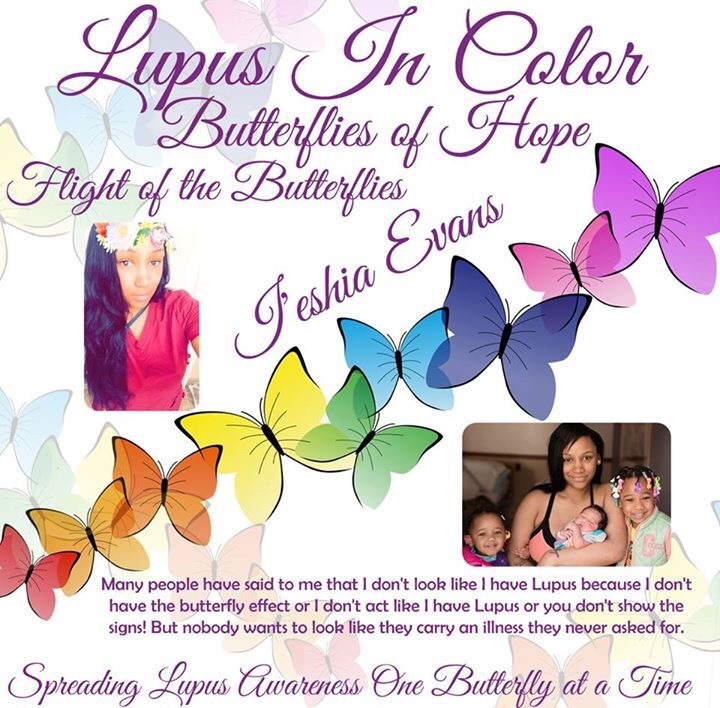 Lupus In Color Salutes you I’eshia Evans. YOU ARE BRAVE, COURAGEOUS AND AMAZING TO SHARE YOUR STORY. 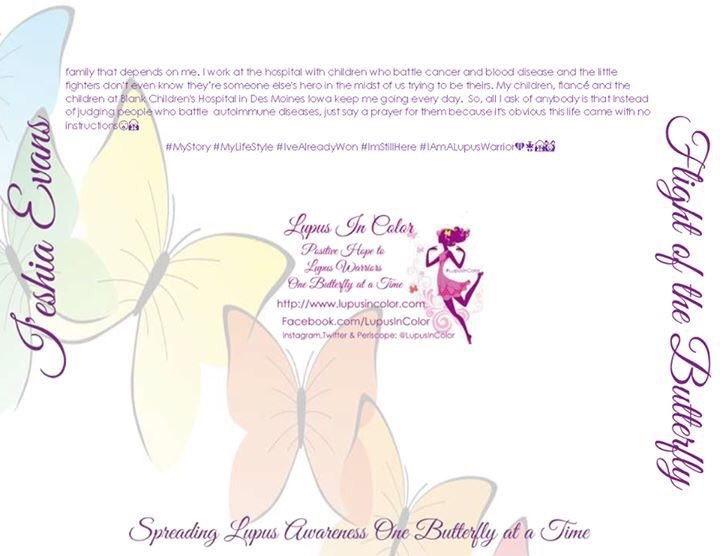 PLEASE SHARE I’ESHIA’S FLIGHT ON YOUR WALL AND START HER BUTTERFLY JOURNEY SPREADING LUPUS AWARENESS!